The Zenfone 4 comes in two variants: one is powered by Qualcomm Snapdragon 660 processor, while the other is powered by Qualcomm Snapdragon 630 chipset. Asus launched Asus Zenfone 4 last year with Android 7.1.1 Nougat out of the box. The phone was updated to Oreo operating system later. Now seems like the company is all set to release the Android Pie update soon as well. 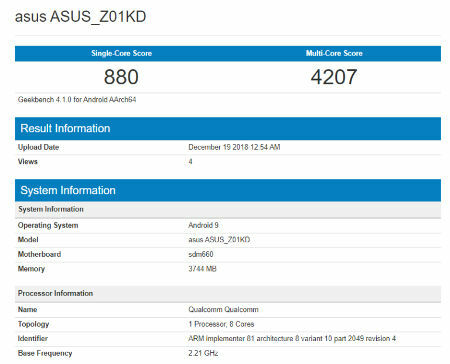 An Asus Zenfone 4 has been spotted on Geekbench with Android 9 Pie which means the phone may be the latest Pie update soon. On the listing, the variant is powered by a Snapdragon 660 processor and not the Snapdragon 630 but it is expected the update to be available to both variants. The Zenfone 4 comes in two variants: one is powered by Qualcomm Snapdragon 660 processor, while the other is powered by Qualcomm Snapdragon 630 chipset. It features a 5.5-inch Full HD IPS display. The Zenfone 4 comes with a dual rear camera setup with a combination of 12-megapixel main sensor and 8-megapixel 120-degree wide-angle lens. It has a 8-megapixel front-facing camera for selfies and video calling. The phone is backed by up to 6GB of RAM and up to 64GB of internal storage. The phone has a 3300mAh battery. It has 4G VoLTE, WiFi 802.11ac, Bluetooth 5.0, GPS, NFC, Type-C and dual-SIM.